Silpakorn University is a well-known public university in Thailand. The university was founded in Bangkok in 1943 by Italian-born art professor Corrado Feroci, who took the Thai name Silpa Bhirasri when he became a Thai citizen. 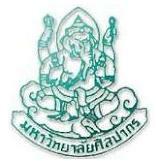 It is the leading Thai university in the fine arts and archaeology, and now includes many other faculties as well. It has about 20,000 students. In 1939 the Pranete Silpakam School was founded on the grounds of Thapra Palace, just north of the Grand Palace, by Mom Luang Pin Malakul. Four years later, during World War II, it became Thailand’s third government university.